I suppose these recipes would qualify as side dishes and I can envision them snuggled up to roast chicken, lamb or maybe even a rosemary rubbed pork loin. But over the years as I’ve skirted in and out of being vegetarian, I’ve come to feel that side dishes can be a satisfying and filling meal on their own. So more often than not, I serve this meal by itself. I’ll leave that choice to you of course. 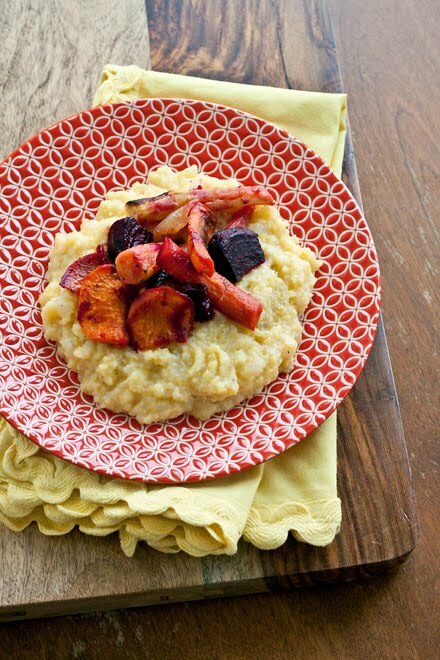 You can also make one dish without the other, serve them side by side, or as I do piling the vegetables atop plated beds of this flavorful polenta. This is not a real recipe, but a method. Any combination of root vegetables works, so feel free to add or subtract as you please. 1. Preheat the oven to 425 degrees. Set out a rimmed baking sheet. 2. Peel sweet potatoes, yams, onions, beets, carrots and/or parsnips if using. Cut into equal sized pieces (as best you can). Place vegetables on baking sheet. 3. Coat vegetables in a generous about of oil, salt and pepper. Toss and spread the vegetables out so they are in a single layer. Do two trays if needed. 4. Bake vegetables for 25 minutes. Flip vegetables over and bake for another 15 to 25 minutes or until tender and caramelized. Save yourself the trouble of having extra cornmeal to store and purchase a small amount of polenta in the bulk section. 1. In a medium-large pot melt the butter over medium high heat until the foam subsides. Add the onions and salt. Cook until onions are soft. About 5 minutes. Add the broth. Turn the heat to high and bring to a boil. 2. Slowly sprinkle in the polenta stirring as you pour. Turn the heat to medium and cook for 20 to 25 minutes stirring frequently until the polenta is thickened and soft to taste. 3. Turn off heat and stir in pepper and cheddar. Serve immediately or pour into a 9x13 inch pan to set. Once cool, cut polenta into squares. I am in love with the Polenta! I eat sidedishes for main meals all the time. This would definitely stand as a meal on it's own in my house! It's basically one dish full of everything I crave constantly. Minus chocolate. Sigh. I have been doing lots of vegetarian meals so I love this sort of dish. I have been thinking about making polenta a lot lately...this sounds like the perfect dish! You managed to do it again, Laura. Excellent combo. Roasted veggies are a staple in this house, but I've never made such a yummy polenta. Will have to remedy that soon! This looks delicious! I've never heard of polenta though, let alone tried it. I don't know if it might an American terminology like cilantro/coriander. Is it like oatmeal? In any case, it looks yummy with butter and onions. Gotta love butter. Sharon you have the right idea. 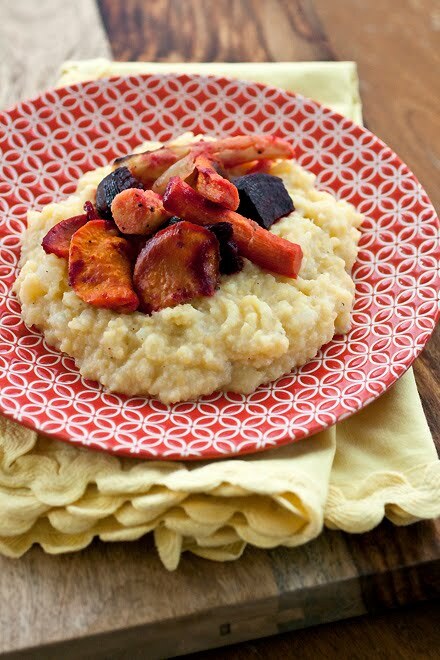 Polenta is a ground cornmeal we eat quite a bit of in the western (mostly southwestern) US. If it’s served as a side don't bother doubling the polenta for the size of your family. This makes enough to fill a 9x13 inch pan with (about) a 1-inch layer. If it's going to be a major part of your meal go ahead and double. You'll probably still have leftovers; just pour them into a pan before chilling. The colors really pop in this photo. Polenta is on my food bucket list, hay we should start a "bucket list" for anything culinary.. "foodish" HMMM? You had me at polenta. Hi Laura! I would certainly serve this as a main dish at my house. Bring on the roasted veggies! This looks so flavorful, and I love how the colorful vegetables look against the creamy polenta. Thank you for sharing yet another delicious recipe. I hope you have a wonderful weekend...enjoy yourself and eat well! What a gorgeous and comforting cold weather meal, Laura. Dish me up a big bowl, please :)! I just posted this on the Cabot Facebook page...a perfect recipe to banish the winter blahs! I wonder what might make a good sauce to drizzle over this. Not tomato, I don't think, though I see that on other blogs. Your thoughts?